The Alexander III Commemorative Egg was made of platinum, gold, white matt enamel, rose-cut diamonds and portrait diamonds. The Surprise was a miniature bust, made of lapis lazuli, gold and rose-cut diamonds. The platinum Egg is completely covered in matt white enamel with gold lines. Lozenge-shape diamond clusters are positioned around the middle of the Egg, each with diamond-set baskets, flowers and ribbons. Portrait diamonds are set at either end, no doubt covering the monogram of the Dowager Empress and the date. Within the Egg there was a miniature gold bust of Alexander III on a lapis lazuli pedestal. 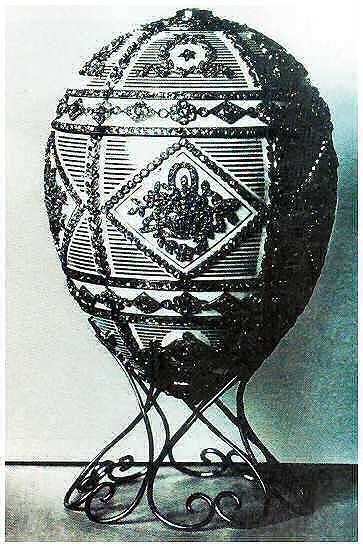 The Alexander III commemorative Egg is only known through a black and white Fabergé photograph, unfortunately not showing the surprise. This Egg has been out of public view since before the October Revolution of 1917.